Number : Season 22, episode 3 of 7. Which One : Giant cockroach in the Tardis. First UK Broadcast : 26 January – 1 February 1984. Plot : The Doctor, Tegan and Turlough crashland the Tardis on an outlying world of Frontios. Where a group of stranded and desperate Earth colonists are seemingly being targeted, by intelligent asteriod strikes. Whats good : The Tardis disassemblement is interesting. 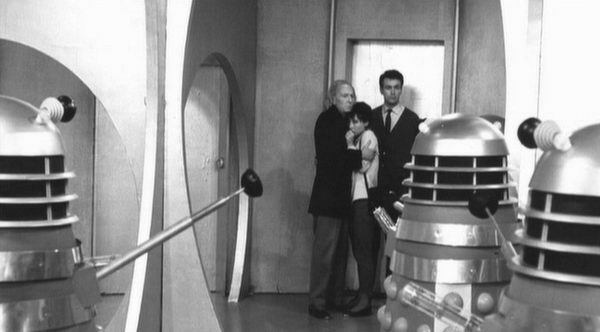 And it’s odd seeing the Doctor willingly invite the Gravis aboard the Tardis. Whats bad : Turlough using the Tardis hat stand, as a pretend gun. Review With Spoilers : Frontios is the third and final story, written by Christopher H. Bidmead. The writer, behind the incomprehensible science facty – Logopolis and Castrovalva. Wisely, Bidmead leaves most of the complex science guff out; for a much more straight forward tale of colonists-under-siege by intelligent asteroids. The destruction and atomic disassemblement of the Tardis into the Frontios landscape, is an interesting sub-peril for the Doctor to face, aside from the meteor strikes and initially defensive colonists. The Doctor meets the culprit behind the meteorstrikes – the cockroach-like Tractators and their leader; the Gravis. The Tractators can control the forces of gravity and are using the meteorites, to clear the planets surface of the human invaders. The Tractators are (phyiscally) ) largely unremarkable Who monsters. Save for the fact, that they are wholly unique – in being one of the few beings that the Doctor ‘willingly’ invites aboard the Tardis. All part of his plan to defeat them – of course. A rather silly moment of Turlough threatening the angry colonist mob with a silver hat stand, doesn’t threaten to undermine proceedings – too much. Frontios is an effective siege episode, with a few interesting ideas thrown in, which we haven’t seen before.